In the water above natural oil seeps in the Gulf of Mexico, where oil and gas bubbles rise almost a mile to break at the surface, scientists have discovered something unusual: phytoplankton, tiny microbes at the base of the marine food chain, are thriving. The oil itself does not appear to help the phytoplankton, but the low concentration of oil found above natural seeps isn't killing them, and turbulence from the rising oil and gas bubbles is bringing up deep-water nutrients that phytoplankton need to grow, according to a new study appearing in the latest issue of Nature Geoscience. The result: phytoplankton concentrations above oil seeps are as much as twice the size of populations only a few kilometers away. "This is the beginning of evidence that some microbes in the Gulf may be preconditioned to survive with oil, at least at lower concentrations," said Ajit Subramaniam, an oceanographer at Columbia University's Lamont-Doherty Earth Observatory and coauthor of the study. "In this case, we clearly see these phytoplankton are not negatively affected at low concentrations of oil, and there is an accompanying process that helps them thrive. This does not mean that exposure to oil at all concentrations for prolonged lengths of time is good for phytoplankton." The study is the first to demonstrate this kind of teleconnection between the sea floor, subsea floor and microbial processes in the upper ocean, said Andy Juhl, an aquatic ecologist at Lamont and coauthor. It also provides insight into how microbes and oil interact under water, he said. Subramaniam and Juhl, along with colleagues in the Ecosystem Impacts of Oil and Gas Inputs to the Gulf (ECOGIG) consortium, began studying interactions around oil seeps after the Deepwater Horizon oil well disaster in 2010, to better understand what happens to oil during catastrophic gushers and to find ways to better respond to similar disasters in the future. The natural seeps, found in many parts of the Gulf of Mexico, are tiny compared to an oil-well blowout. An oil slick from a natural seep lasts between one and seven days and reaches between 1 and 100 square kilometers. In comparison, the surface oil from the Deepwater Horizon well covered about 11,200 square kilometers and persisted for months, Subramaniam said. But natural seeps still produce enough oil and gas that the scientists can smell it at the surface and see the oil bubbles burst. In the lab, Juhl has been conducting experiments to understand how different concentrations of oil affect different types of phytoplankton. He has found no amount of oil on its own that has a positive effect on phytoplankton. "The direct effect of oil is usually negative, but in some cases small amounts of oil can be outweighed by the positive effect of the nutrients that are tagging along," Juhl said. Lead author Nigel D'Souza, then a postdoctoral researcher at Lamont, discovered the phytoplankton response to oil seeps while on a ship in the Gulf of Mexico monitoring chlorophyll fluorescence – energy that is emitted as light by compounds inside phytoplankton cells used for photosynthesis. 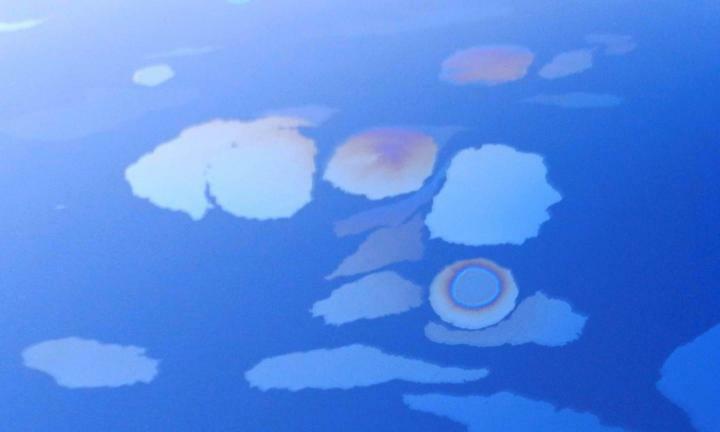 Each time the ship crossed over a known oil seep, he noticed a spike in phytoplankton abundance. It was a eureka moment, Juhl said. The evidence backed up what Susan Phan, a coauthor and Columbia University student working on her senior thesis with Subramaniam, had previously noticed in remote-sensing data. The scientists were able to compile multiple lines of evidence through chlorophyll fluorescence, water sampling and satellite images that all supported the idea that phytoplankton were benefitting from something connected with the seeps, even though the seeps were thousands of feet below. The biggest impact was seen a few hundred feet deep in the water column, at the point where phytoplankton have enough light from above to still grow, and are receiving the most nutrients rising from below. Over oil seeps, D'Souza found that the population was about double the usual amount. The measurements also showed increases in phytoplankton abundance at the surface. There are still many questions. For example, scientists don't yet know which types of phytoplankton are thriving over the seeps, or if some types of phytoplankton in the community are negatively affected by the rising oil. Previous studies have subjected phytoplankton to oil in laboratories to test their sensitivity and found differences in the impact on oceanic vs. coastal phytoplankton and differences when phytoplankton were in nutrient-rich or nutrient-poor water, as well as damage to some phytoplankton cells at various concentrations of oil. The microbe community at the surface is also complex and includes oil-degrading bacteria and other microbes. The increase in phytoplankton could, for example, be affected by the impact of oil on bacteria that compete with phytoplankton for nutrients, the authors write. "Satellite radar data have given us a detailed picture of where natural seeps are concentrated across deep seafloor of the Gulf of Mexico," said co-author Ian MacDonald, an oceanographer and professor at Florida State University. "Building on this, the present, novel results show biological effects near the ocean surface in areas where seeps are most prolific." Subramaniam and Juhl plan two pathways of study next: to analyze the behavior of different types of phytoplankton above seeps to better understand how they interact with oil, and to improve understanding of how oil from deep underwater rises to the surface. The study was part of the ECOGIG Consortium, a multi-institutional group that studies natural oil seeps in the Gulf of Mexico, funded by the Gulf of Mexico Research Initiative. The other coauthors on the study were Mark Hafez, Alexander Chekalyuk, and Beizhan Yan of Lamont-Doherty Earth Observatory; and Sarah Weber and Joseph Montoya of Georgia Institute of Technology. D'Souza is now a postdoctoral fellow at Georgia Institute of Technology. The paper, "Elevated surface chlorophyll associated with natural oil seeps in the Gulf of Mexico," is available from the authors. The Earth Institute, Columbia University mobilizes the sciences, education and public policy to achieve a sustainable earth. http://www.earth.columbia.edu.